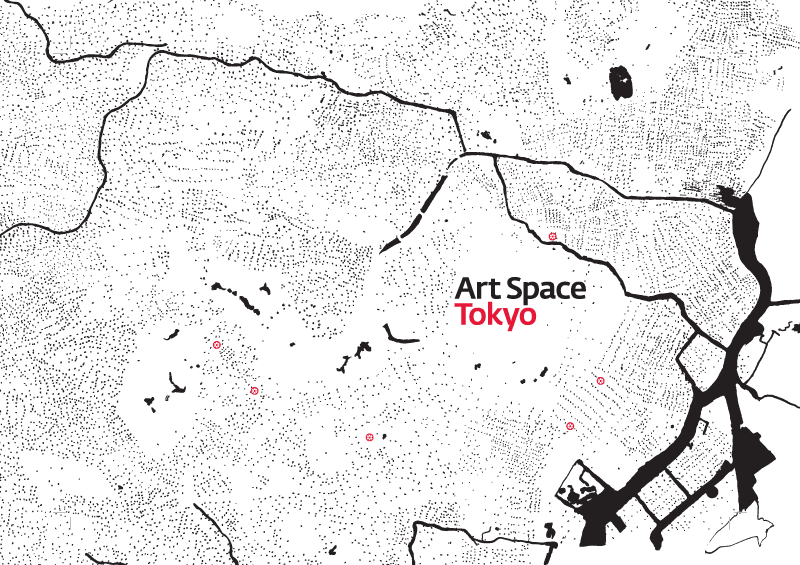 Whenever it is that I’ll finally get an opportunity to make it to Japan, I plan to take with me a copy of “Art Space Tokyo,” an unexpectedly stunning bit of cultural travelogue from Chin Music Press. It’s a beautiful — and I mean gorgeous — guide to “twelve of Tokyo’s most distinctive galleries and museums,” written in English, lovingly edited by Ashley Rawlings and masterfully designed and curated by a friend of mine, Craig Mod of Hitotoki fame. The book is a tour of the nooks and crannies of Tokyo’s art world, going behind the scenes with twelve significant galleries within the city limits. But to my mind, it easily qualifies as a work of art of its own. The cover, a simple ink-drawn map of the city by Mod, was delicately silkscreened and stretched across the hardback cover. It feels quite luxurious and sparing at once, and it gives that very visceral, tactile satisfaction that only painstakingly printed and bound books can. Even better, the pages are generously appointed with exquisitely reproduced ink illustrations by Nobumasa Takahashi. Considerable effort was made, apparently, to reproduce Takahashi’s subtle ink wash textures; you can see the many undulations of brush and inky bubbles in fine-grained detail. Poring over his many drawings of galleries and portraits, I found it hard to believe at times that they were reproductions and not actually original illustrations, penned and brushed right into the pages. All this, and the whole thing is still a steal at just US$30. I fully expected an Amazon referrer link after praising the book into heavens but it was not. Respect. I don’t know why, but I’m rather excited by the second image. The correspondence of the colored paragraph text, with the circled number at the line start, pinpointing the area on the map is just, well, f*ing genius. I’ve been stuck on a redesign for a few weeks now, and I feel like I just looked in the back of the book for the answer to my design block. Most edifying article, or picture, I’ve read in weeks. Thanks Mr. Vinh! $30 is a steal indeed! Sometimes black and a spot color looks better than CMYK ever could. Thanks for the recommendation! Going to hit up Kinokuniya (over on 6th ave btw 40th & 41st) for this one. BTW, whenever you DO hit up Tokyo, I recommend touring the area by bicycle. You can’t beat 300YEN (~$3) for 3 days! and plus, the drivers there aren’t as crazy as the ones in NYC. Previous Post Glassdoor.com Anonymous satisfaction ratings and salaries from employees of well-known companies. Next Post Refinery29: Maria Schneider in Antonioni’s “The Passenger” A shallow but nevertheless deserved appreciation for the actress’ indelible turn in one of Antonioni’s best.